I was hesitant about this stop but Mike seemed pretty excited about it and then a good friend told me how much she loved this city and the surrounding area. Now? Now I can't wait to go back. I love Florence. She stole my heart somewhere on her winding, tiled streets. It's absolutely gorgeous. The city is beautiful in an old world sort of way. If you read at all or are a history buff, you can easily imagine yourself transported back to the Italian Renaissance. 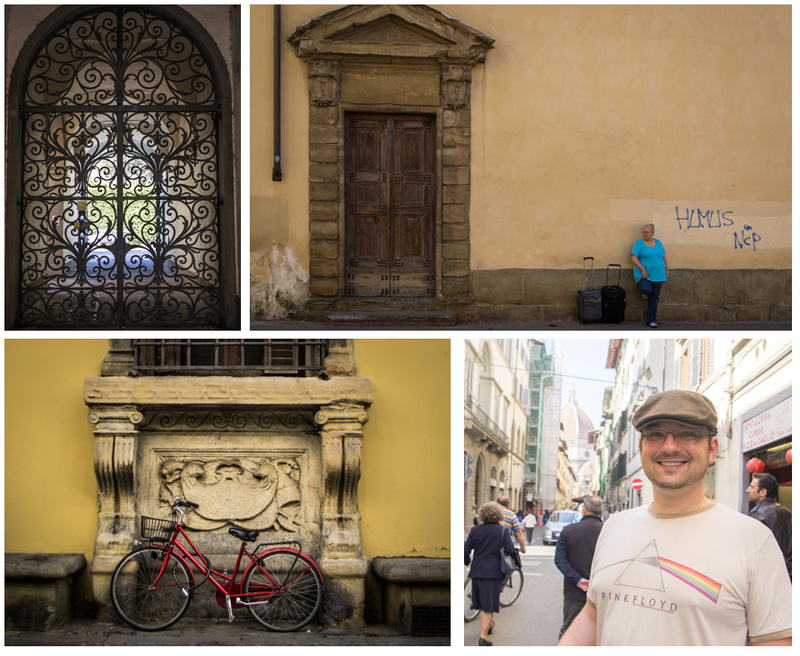 You can almost imagine the Medici era happening all around you. Left: The Medici Chapel. Right: An altar in the Baptistery. It was completely absurd to me the massive amounts of wealth on display in both Florence and in Rome. 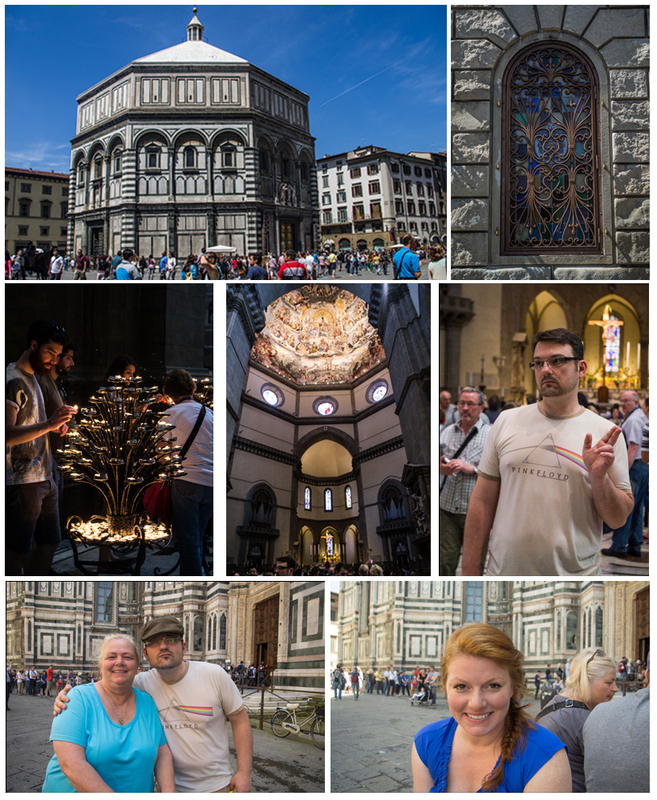 The churches were magnificent, to be sure, but to think about the wealth of these families (primarily the Medicis and the Borgias, respectively) and how they spent it to bolster their power and to essentially try to buy their ways into heaven... well, it did taint the experience a bit. I wonder how much good they could have done for their citizenry with even a fraction of the money they spent promoting themselves. On the other hand, they were extremely influential patrons of the arts and sciences and helped to usher Italy into a new, more prosperous era. I find them infinitely fascinating. I cannot get enough of their history and culture. 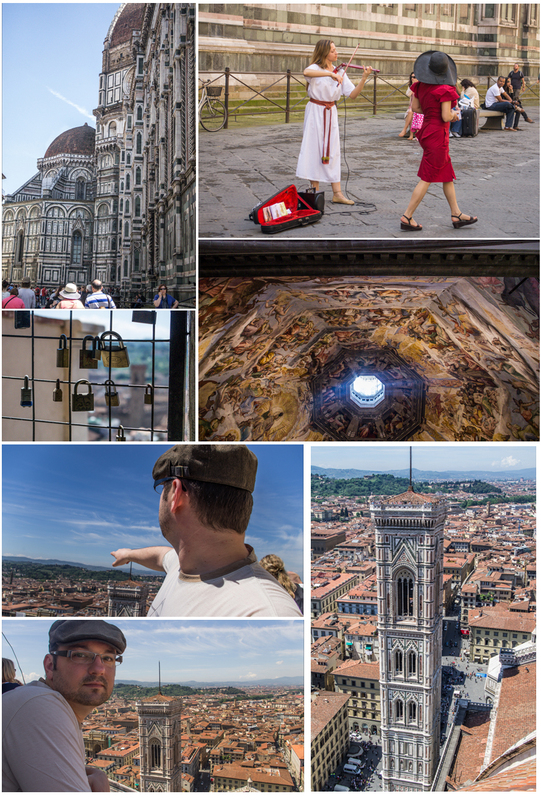 Around and on top of the Basilica di Santa Maria del Fiore. Yes, we climbed 463 really old steps to the top. Totally worth it! 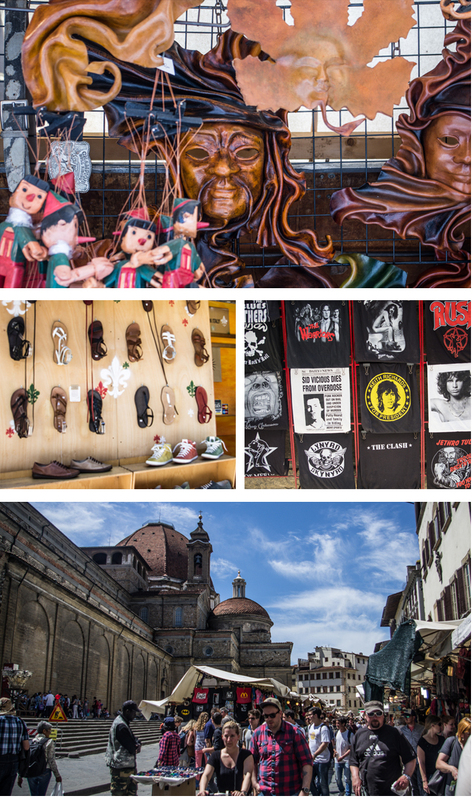 Florence is not very big and all of the tourist hot spots are very near each other. It's an easily walkable city. The line to see the statue of David was crazy long (it wrapped around several buildings) so we didn't do that. The line to see the fake David was super long, too. We decided to have lunch instead. I sometimes wonder if I'm going to look back and regret not standing in that line. Meh. Maybe we'll go back one day and maybe I'll get to see it then. It gives me something to look forward to. Travel Tip: you can book the Accademia (the museum that houses David) in advance so you don't have to wait in the long lines. We had a very fluid a basically unplanned itinerary so that wouldn't have worked for us, but I think next time I'll take advantage of that and try to see some of the other museums as well. The Baptistery of San Giovanni. It's much smaller but I liked it better than the Duomo, maybe because my legs didn't feel like jelly. Probably one of my favorite parts of Florence would have to be the markets. Streets and streets filled with pop up tents stocked with leather goods and sunglasses and shoes. It was a Shoppers Delight. I so need to go back and do that again because I did not take advantage of it this time around. I've heard the leather workers are impressive artisans and that some of them will show you how they work. I certainly enjoyed admiring their purses! I talked myself out of buying 1 (or 10) because I thought the shopping would be better in Rome. It wasn't. Woe is me! Views from the train on the way from Florence to Rome. I told you this area is beautiful! Wanna know how we spent our time in Rome? Check it out! Fresh Fruits & Veggies, Oh My!